Showing results for tags 'swd'. New, never fired, in stock and will ship in the original box with all the accessories and manual. Will transfer out on a F3 and will eFile for quickest transfer times. Price $1,465 and Shipping is included. 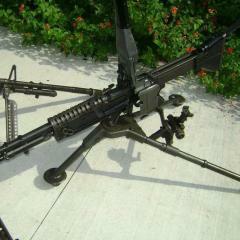 Selling a new SWD M11/9. Excellent. Form 4 in Alabama. $8500 shipped. The major drawback of the SWD M-11/9 has always been it's very high rate of fire. It's little more than a bullet hose in OEM form. Over the years, various methods have been employed to reduce the ROF. These have ranged from dismal to very good. Unfortunately, rate of fire reduction has come at the expense of overall size... until now. The CF-W bolts are manufactured from heavy Tungsten alloy. While very close to the density of pure tungsten, heavy alloy provides a unique combination of corrosion resistance, density, mechanical strength, and machinability. This increases the bolt's original weight of 15.88 ounces up to 32 ounces, and reduces the ROF by over half. Easy singles are now possible while retaining the gun's original compact size.The reviews of the first run of 100 have been very positive and they sold out quickly. http://www.mac-11.info/review-cf.htmThe bolts are delivered pre-assembled and ready to drop into your OEM upper or side cocker. Cost for a completely assembled CF-W bolt is $750.00. We now offer $9.99 USPS Priority Mail shipping! Your package is fully insured, so an adult signature is required at time of delivery. Credit cards are cheerfully accepted but their use will add a 3.5% up charge.To order, please call 1-702-763-1269 from 9:00AM to 6:00PM Pacific Time, Monday through Saturday. For additional information please email VegasWbolts@gmail.com. Sorry, no Nevada sales at this time. We have every part needed for an OEM style bolt. These are in stock and ship via Priority Mail for a flat $3.00 charge. *Extra polyurethane buffers are available for $4.50 each. *I'd strongly suggest the purchase of an extra ejector rod for $11.00. *Recoil spring guide rods are available for $10.00 each. *Spare recoil springs $7.50 each. Two recoils springs, $13.25. *I have a few NOS original "hockey puck" style cocking knobs at $15.00 each. *Enhanced extractors are $9.50, extractor spring is $4.50. *OEM style firing pins, $20.00*Firing pin retainers $9.00. *Extractor roll pins, 2 for $2.00. *Recoil/back plates $7.50. Go from this... To this! *A 9mm CF-W bolt for the SWD M-11A1 .380acp buzz guns is now being sold. The future is tungsten!